The PYTHIA research project has officially kicked-off. 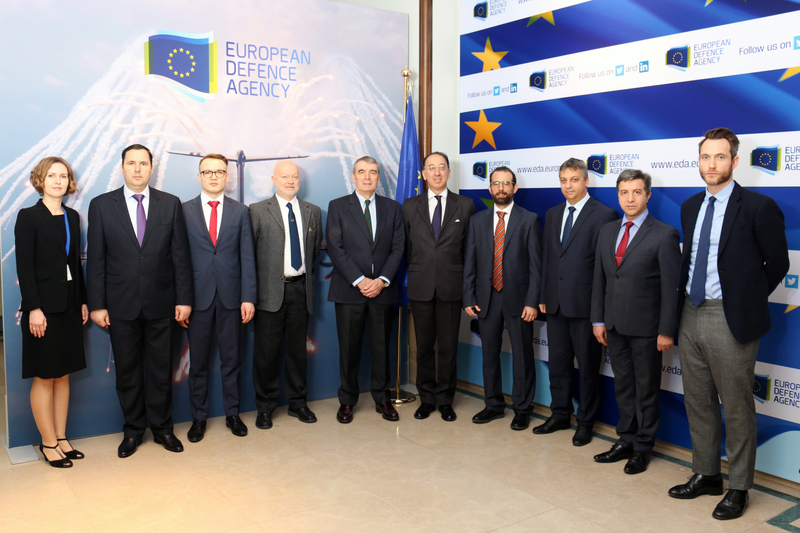 The kick-off meeting was held on the 14th March 2018 at the headquarters of the European Defence Agency, with the presence of EDA’s Chief Executive Mr. Jorge Domecq. The PYTHIA (Predictive methodologY for TecHnology Intelligence Analysis) research project, funded by the European Defence Agency within the context of the PADR programme (EU Preparatory Action for Defence Research) is dedicated to the theme of Strategic Technology Foresight. The project aims to support strategic technology foresight of individual Member States and of the EU as a whole in the defence domain by performing joint technology foresight activities supported by methodologies such as horizon scanning, technology watch, scientometric tools and expert consultations. It also focuses on identifying emerging defence research areas for potential exploration in the next Multi-annual Financial Framework. Zanasi & Partners covers the role of scientific and technical coordinator of the whole project. The European Commission has recently announced that two research project proposals – presented by Zanasi & Partners within the context of the Horizon 2020 Secure societies work programme – have been selected for funding. The two projects are FINSEC (Integrated Framework for Predictive and Collaborative Security of Financial Infrastructure) and TRESSPASS (robusT Risk basEd Screening and alert System for PASSengers and luggage). The FINSEC project, presented in response to topic CIP-01-2016-2017, by putting together major players in physical and IT security, aims at studying and developing innovative solutions for the (cyber-)security needs of the financial sector as a whole. Coordinated by GFT Italy, the FINSEC consortium comprises a total of 23 partners, including big names from the IT (Atos, IBM, Fujitsu, Hewlett Packard) and financial (Barclays, Liberbank) sectors. The project will work with an estimated budget of 10,194,437.50€ (7,817,631.25€ EC contribution). Zanasi & Partners will coordinate a work package dedicated to dissemination, communication and exploitation. At the same time, leveraging on its skills and expertise in cyber-security, risk assessment and big data analytics, Z&P will provide a horizontal contribution to the whole project. TRESSPASS, submitted in response to topic SEC-15-BES-2017, aims at developing a new cohesive risk-based concept of border management and demonstrating its validity in real scenarios. Coordinated by the Greek research centre Demokritos, the TRESSPASS consortium comprises a total of 22 partners, including three border guard authorities (from the Netherlands, Greece, and Poland) and other end users such as the Schiphol airport and the Piraeus Port Authority. The project will work with an estimated budget of 9,299,391.25€ (7,901,470.75€ EC contribution). Within the TRESSPASS project, besides contributing to the definition of a Big Data-based risk assessment methodology for border control, Zanasi & Partners will notably lead a work package dedicated to the collection of end user requirements and needs. Both projects are expected to kick-off in the first half of 2018 and will last respectively for 36 (FINSEC) and 42 (TRESSPASS) months. Zanasi & Partners has attended SMI2G 2018, the traditional meeting of the European security research community, which takes place yearly in Brussels. 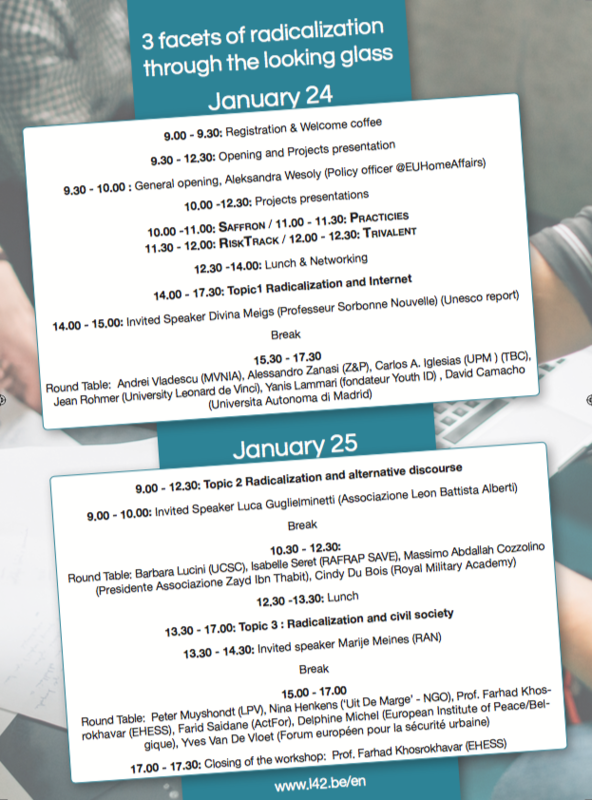 The 2018 edition – sponsored by EARTO, SEREN3 and EOS – was hosted by the Université Catholique de Louvain (UCL) and ran on the 1st and 2nd February. 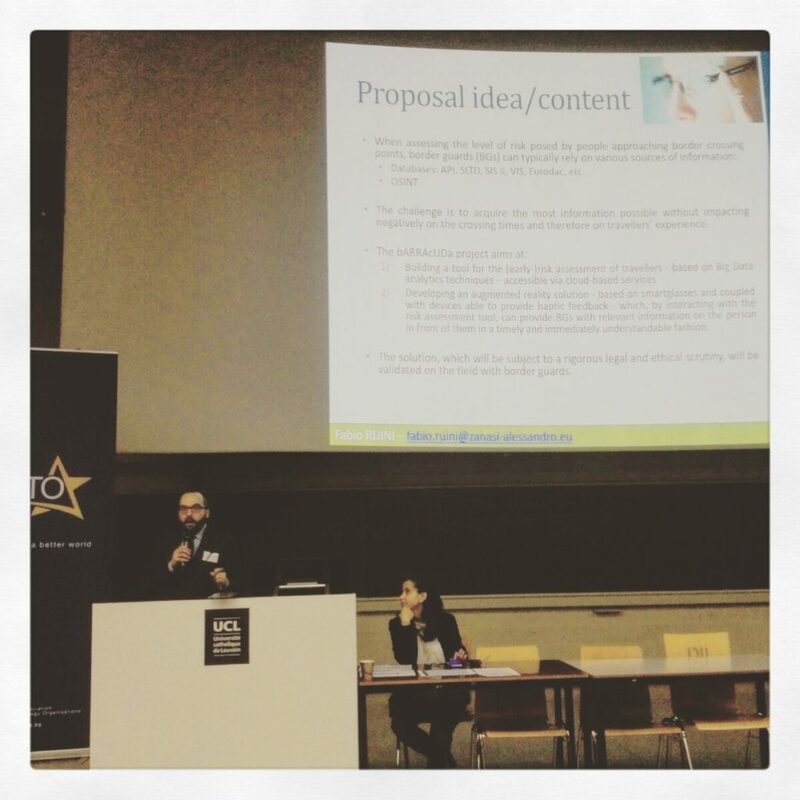 During the event, Z&P’s Fabio RUINI presented three project ideas that Zanasi & Partners intends to further develop in the coming months, targeting the 2018 calls of the H2020 Secure Societies work programme (topics SU-BES02 sub-topic 1, SU-DRS01 and SU-DRS02 sub-topic 1). 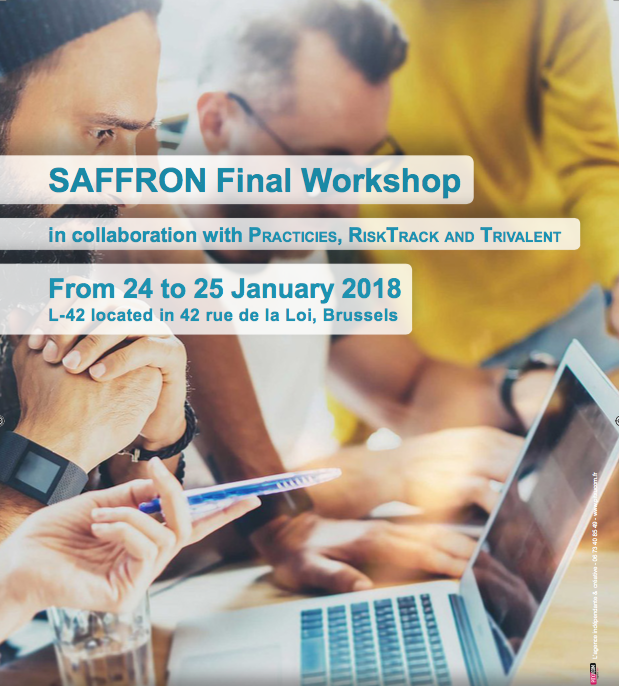 VISEO, and the whole consortium behind the EC-funded SAFFRON project (Semantic Analysis against Foreign Fighters Recruitment Online Network), organise in Brussels a workshop titled “3 facets of radicalisation through the looking glass”. The event is organised in collaboration with other EC-funded research projects: TRIVALENT (Terrorism pRevention Via rAdicaLisation countEr-NarraTives), PRACTICIES (Partnership against violent radicalization in the cities) and RISKTRACK (Tracking tool based on social media for risk assessment on radicalisation). Zanasi & Partners will be represented at the event by Z&P’s president Alessandro ZANASI, who will take part to a round table discussion dedicated to “Radicalisation and Internet”. Participants to the round table include representatives from Romanian National Intelligence Academy (MVNIA), Universidad Politécnica de Madrid, Pôle Universitaire Léonard de Vinci, Youth ID, and Universidad Autonoma de Madrid. The European Defence Agency has officially announced the signing of a Grant Agreement – worth nearly €1 million – for the Strategic Technology Foresight action to be carried out under the EU Preparatory Action in the field of defence research. The Grant Agreement has been signed between EDA and the Italian-led consortium behind the project proposal PYTHIA (Predictive methodologY for TecHnology Intelligence Analysis). The PYTHIA project, which will see Zanasi & Partners covering the role of technical and scientific coordinator, is expected to kick-off in February 2018 and will last for 18 months. A grant agreement worth a total of €0.95 million was signed on 20 December 2017 for the Strategic Technology Foresight action to be carried out under the EU Preparatory Action in the field of defence research. The grant agreement was signed between the European Defence Agency (EDA) and the winning consortium led by Engineering Ingegneria Informatica S.p.A. The Strategic Technology Foresight action was selected following an EU-wide call for proposals organised by the European Defence Agency between 7 June and 28 September 2017. The action aims to support strategic technology foresight of individual Member States and of the EU as a whole in the defence domain by performing joint technology foresight activities supported by methodologies such as horizon scanning, technology watch, scientometric tools and expert consultations. It focuses on identifying emerging defence research areas for potential exploration in the next Multi-annual Financial Framework. The Strategic Technology Foresight activity is part of the Preparatory Action, aimed at assessing and demonstrating the added value of EU-supported defence research and technology (R&T). The relevant results are expected to further deepen European defence cooperation, address capability shortfalls, and strengthen European defence stakeholders. The foundations for the Preparatory Action were laid in 2016 with the successful launch of a Pilot Project on Defence Research. The signature marks an important step in EU defence integration and paves the way for the launch of a fully-fledged European Defence Research Programme (EDRP) as part of the EU’s next Multiannual Financial Framework (2021-2027). The next step will be the signature of the grant agreements related to the Unmanned Systems and the Research in technology and products in the context of Force Protection and Soldier Systems calls for proposals, which are scheduled to take place in 2018. All of them – Pilot Project, Preparatory Action and the future European Defence Research Programme – should support R&T serving capability priorities identified by Member States in the Capability Development Plan and be taken up in future collaborative capability programmes. Zanasi & Partners’ CEO, Alessandro ZANASI, has been nominated member of the scientific council of Fondazione Icsa (Intelligence Culture and Strategic Analysis). Fondazione Icsa – presented in 2009 by now Italian Minister of the Interior Sen. Marco MINNITI, by then President Emeritus of Italy, Sen. Francesco COSSIGA, and by the current President of ICSA and former chief of staff of the Italian Air Force, Gen. Leonardo TRICARICO – is a prestigious Italian think tank, headquartered in Rome, which mainly focuses on the analysis of the phenomenon linked with internal and external national security, defence strategy, intelligence and cybersecurity. 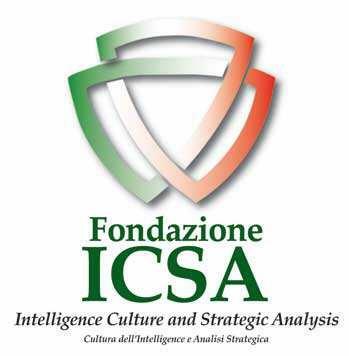 One of the aims of Fondazione Icsa is to contribute to the diffusion of an intelligence culture in Italy, via the organisation of thematic events (workshops, seminars, forums) as well as with the production of editorial products (reports, books). Fondazione Icsa can count on a scientific council – composed by renowned experts in defence, security and intelligence matters – which supports the organisation during the implementation of strategic, systemic and historiographical analyses. The scientific council is chaired by Italo Saverio TRENTO, who currently serves also as Director of Icsa. An article written by Zanasi & Partners’ CEO, Mr. Alessandro ZANASI, and dedicated to the cyber security research initiatives launched by the European Union in the latest years, has been published today on ICT Security Magazine. Alessandro Zanasi provides a comprehensive overview of the main cyber security challenges that the European Union has been facing in the latest years and, at the same times, describes the most relevant research initiatives that have been launched for responding to those challenges. A particular emphasis is put on some of the most successful research projects backed by the European Commission and its Directorate General: SCADALAB, CloudCERT, SECRET, iSAR+ and SOTERIA. The article also introduces two new themes of sure interest for the future of European research: on the one hand the need for enhancing the cyber-security posture of the European financial sector; on the other hand – in the light of the future risk scenarios introduced by rapidly evolving modern technologies – the need for improving the strategic technology foresight capabilities of the defence sector. The article can be found at this link. A PDF version can be downloaded from here. 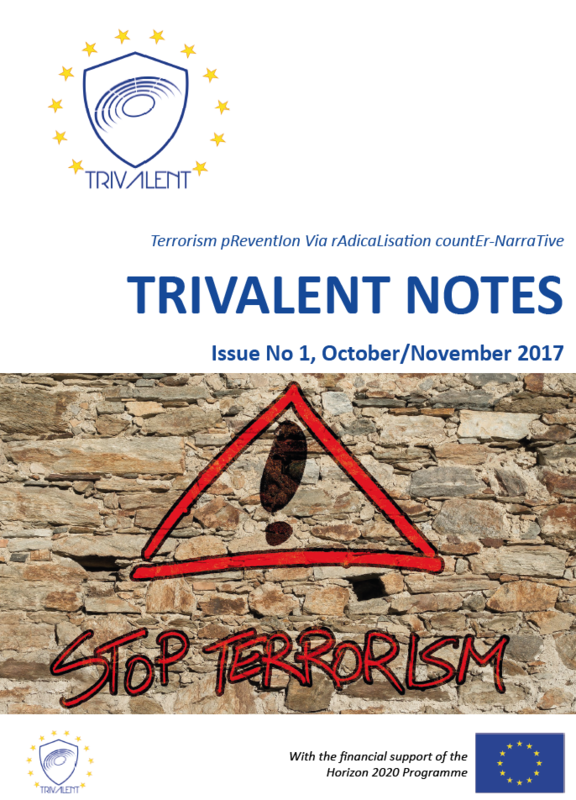 The TRIVALENT consortium is proud to announce the release of the first issue of “TRIVALENT Notes”, the official newsletter of the TRIVALENT (Terrorism Prevention via Radicalisation Counter-Narrative) project. TRIVALENT Notes – Issue no. 1 (October/November 2017) can be downloaded from here. 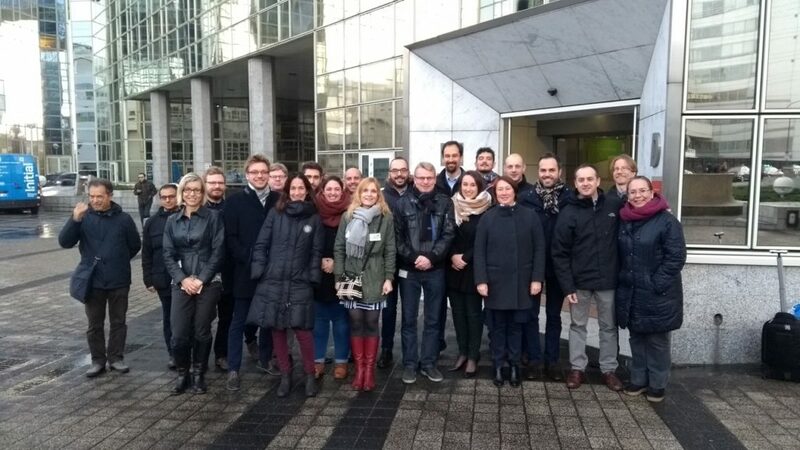 Kindly hosted by CEA in its headquarters, representatives from all the European organisations part of the BODEGA consortium have met in Paris from the 27th to the 29th November 2017 in order to assess the work carried out so far and make plans for the future activities to be performed. Zanasi & Partners was represented in Paris by Fabio RUINI, coordinator of Z&P’s research activities, and Alessandro BONZIO, Z&P’s project manager for BODEGA. Within the BODEGA project, Zanasi & Partners is currently involved in the development of an innovative solution – based on Big Data Analytics techniques – for the (early) risk assessment of incoming travellers at border crossing points. The meeting gave Z&P the opportunity to present the latest developments on this topic, as well as to get expert feedback from the end-users, most notably from representatives of Agenzia delle Dogane e dei Monopoli and the Finnish Border Guard Agency. Zanasi & Partners’ CEO, Mr. Alessandro ZANASI, delivered a speech during the conference “The challenges of radicalization: the role of the institutions, religious communities and civil society”, organised in Rome within the context of the TRIVALENT project. 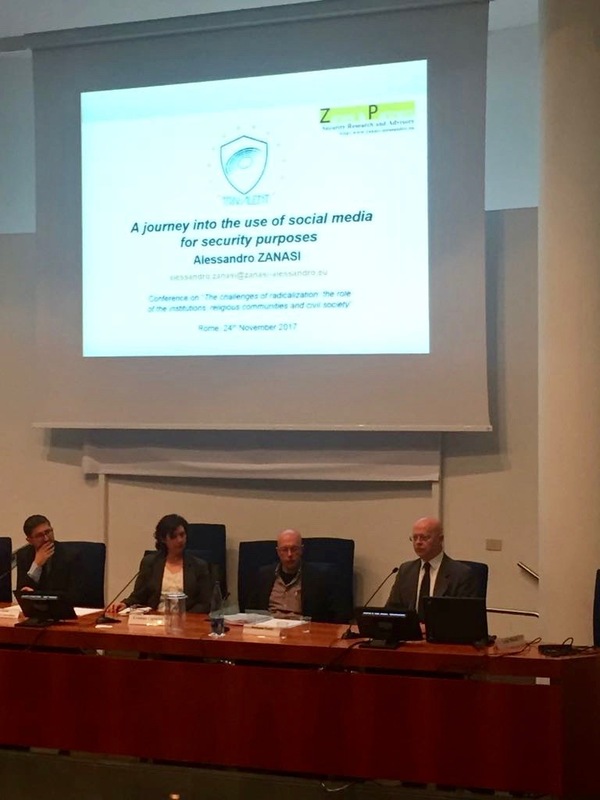 During his speech, titled “A journey into the use of social media for security purposes“, Mr. Zanasi presented the opportunities that Big Data analytics (and text mining technology in particular) offers to law enforcement agencies dealing with the task of preventing violent radicalisation.